BOULDER, Colo. (BRAIN) — The final hurdle has been crossed — a majority of the members of the Bicycle Product Suppliers Association have voted to approve their organization's merger with PeopleForBikes. Decathlon has adopted its business model to work in 48 wildly different countries on five continents in some 1,600 stores — but is just starting in the U.S. With global bike sales estimated at $2.2 billion in 2018, it is arguably the world's largest bicycle retailer on a revenue-basis, moving some 4.5 million bikes annually, and outfitting more cyclists in its private-label bike clothing than any other brand. Podcast host Kristin Carpenter talks with Sophie O'Kelly de Gallagh about the U.S. launch for the giant France-based retailer. Wholesale bike unit sales down 20% in the first quarter. BOULDER, Colo. (BRAIN) — Wholesale bike sales overall were nearly flat in March compared to last year in dollars, and down slightly in units. 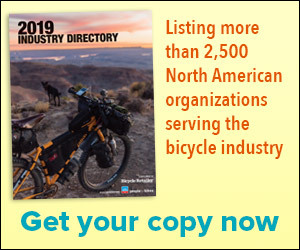 The month's results capped a first quarter that saw a 20 percent decline in bike units sold in to retailers, according to the Bicycle Product Suppliers Association's Sell-in Report. PHILADELPHIA — (BRAIN) Joe Wentzell didn’t know it at the time, but his ambition to participate in triathlons would play a role in helping save a woman’s life. IRVINE, Calif. (BRAIN) — The National Bicycle Dealers Association's new program, P2 Launch, is being positioned as an entry-level version of the dealer organization's Profitability Project (P2), a peer-to-peer program intended to help retailers increase profitability. OSAKA, Japan (BRAIN) — High-end bike sales in North America and e-bike sales in Europe helped drive sales increase. Losses from a March 2018 factory fire remain significant, however. BOULDER, Colo. (BRAIN) — Bicycle Retailer & Industry News has hired a new managing editor, Dean Yobbi, who joined the staff earlier this month. DURANGO, Colo. (BRAIN) — Erik Saltvold of Erik's Bikes, Board and Ski is the latest guest on a special podcast series produced by Verde Brand Communications and BRAIN. These press releases are posted as a service to our readers and are not edited, endorsed, or fact checked.